Geetha is an Indian actress who has performed in Tamil, Telugu, Malayalam, Hindi and Kannada language films. She debuted in the Tamil language film Bhairavi as Rajnikant's sister. Since then she has acted in films of all the South Indian languages, and in a few Hindi films. She made her cinematic debut through the 1978 Tamil film Bairavi in which she played the title role as Rajinikanth's sister. Her performance in the Malayalam movie Panchagni (based on the true life story of Naxalite revolutionary Ajita), opposite Mohanlal was well acclaimed. Geetha also acted in Tamil tele-serials like Kai Alavu manasu and Engirindho Vanthaal, both directed by K. Balachander. She debuted in a Tamil film Bhairavi as Rajnikant's sister. She studied in Bangalore up to grade 7, at Raghavendra High School, Malleswaram, Bangalore. Her father worked for a multinational company and they moved to Chennai, where she completed her high school at T. Nagar Girls High School. In 1997, she married Vasan, a chartered accountant. The Malayalam cinema which gave her break, utilized her as a character actress and she is one of the top actresses of Malluwood film Industry due to her meaningful roles. With her mentor Director K. Balachander she put in some superb performances notably in movies like Ninaithalae Innikum, Puthu Puthu Arthangal, Kalki, Azhagan, and her excellent roles in Malayalam; the one in Panchagni, opposite Mohanlal, which was based on the true life story of Naxalite revolutionary Ajita, the role fetched her many accolades. After her marriage in 1997- she quit acting for a brief period- however she has returned to the Industry and has acted usually as the hero's mother in movies like Santhosh Subramaniam and Unakkum Enakkum. 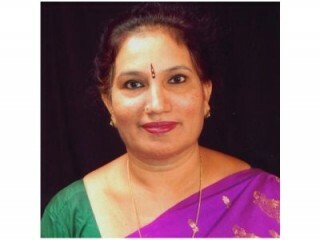 View the full website biography of Geetha.